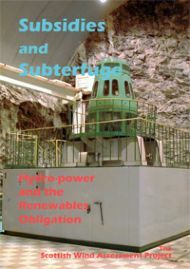 During consultation on the Renewables Obligation (March 1999-March 2001), it was agreed that existing large hydro-power stations should, as a mature and profitable technology, be excluded from the subsidies regime. After consultation closed, hydro generators pressed the government to reverse the decision, citing ageing plant and poor trading conditions. Two late changes to the rules were to the benefit of large generators. The first, lowering the subsidy threshold to include hydro-stations under 20 MW, was made public. The second did not come to light until 2004. It had allowed owners to cut the capacity of large turbines to bring them below the 20 MW qualification limit. The first result of the Renewables Obligation scheme was that UK hydro-generation capacity went down, not up, for the first time in the technology’s 100-year history. Claims that efficiency improvements justfy the capacity cuts are disputed as losses due to increased water wastage are inevitable. These losses are equivalent to closing Pitlochry power station. The report examines how these decisions came about and argues that the subsidy payments which large hydro-generation now attracts are not justified by the modest quantity of additional electricity being produced. A megawatt-hour of additional electricity is now attracting subsidies of around £500. Although the policy is costing electricity consumers over £100 million a year, it has done little to increase the quantity of new renewable generation. It is an appallingly inefficient way to cut CO2 emissions. • Subsidising old hydro power is currently the subject of a petition to the Scottish Parliament - details here.